So you won’t read this until Saturday at the earliest, but this is a pseudo Film Score Friday Top 5 in that it covers five of my favorite Lost moments. While I might not have talked as much about Michael Giacchino’s magnificent work on the just ended series as, say, Bear McCreary and BSG, my love for it is no less. Today, I am going to discuss a bit about how Giacchino constructed some of what I consider the show’s best musical moments. And in a Temp Track first, I’m going to give you musical examples! It’s going to be legen…wait for it…dary! Let’s see how this goes. WARNING —- WARNING —- WARNING!!!! SPOILERS AHEAD!!! So if you haven’t seen ANY of Lost, then you might not want to read any further. Okay, still with me? Great. So I’ve mentioned in some earlier posts that Giacchino constructs many of his cues from small musical cells, starting with a very sparse texture (many times just piano and maybe a cello) and building up from there. He’ll repeat the same material, adding countermelodies and other things, but the core harmonic and melodic cell remains. The first one I want to talk about is one of the most heard themes in the entire show, simply titled “Life and Death.” As many of you might know, even if you’re not fans of the show, Lost was by no means shy about killing main characters, or even secondary, hell even minor characters. Let’s face it, people dropped like flies on that wacky island. In the twentieth episode of the first season, we had the first major death, Boone. But what was so great about it was that it was paired with the birth of Claire’s baby, Aaron. Hence life AND death. The cue proper that I’m discussing begins about forty seconds into this clip. The first chord of the last bar does change occasionally, so I’ve gone with what is heard in the first full statement. As I said, this theme is reused many times whenever a major character dies. One of the most heartbreaking of all deaths on the show was the end of season three when Charlie dies, and without fail, the theme is brought back out, but with a new (counter)melody. But let’s move to something a bit more uplifting. Other than the death of Charlie, just shown, one of the most refered to moments of the show is the end of the episode “Walkabout” (season 1, episode 4), and I must admit that this was the scene that got me hooked. I had never heard such music for a television show (I had yet to watch BSG), and I knew I had to go out and buy the season 1 DVDs. It really is a simple two-part, four measure phrase with a slowly ascending melody and an eighth-note ostinato. In this clip you’ll hear it slowly build up (the dialogue buries the beginning of the cue) as we see Locke slowly realize that he has feeling again in his legs and stands for the first time in years. It was a powerful moment, especially because before this episode we had no idea that Locke had been in a wheelchair prior to the crash. Again, what standout in my mind is how Giacchino builds something so powerful out of such simplicity. As I said, tiny cells of music built up, and, of course, the addition to the trombones just drives the whole cue home. They all have the same harmonic foundation of alternating Db major and G minor chords and are arranged as A-B-A-A-B-A-A-AC-AC-AB-AC-AB-AC-AB (where the letters are together, it indicates the cells being played at the same time). In the scene below, also notice how in the first five iterations that there is a measure of pause inserted lengthening each cell to eight measures. And like all these themes, they appear again and again. When, in season 2, the people who were on the raft finally make it back to the beach, we hear this theme once again with a few new twists. As you can hear, it is constructed just as the previous cues, starting with a simple piano version before adding strings and a countermelody to the proceedings, and then fading back away. In many ways, this cue is related to the earlier “Life and Death,” especially in that instead of continually building, such as with Locke’s cue or “Parting Words,” it fades back out. 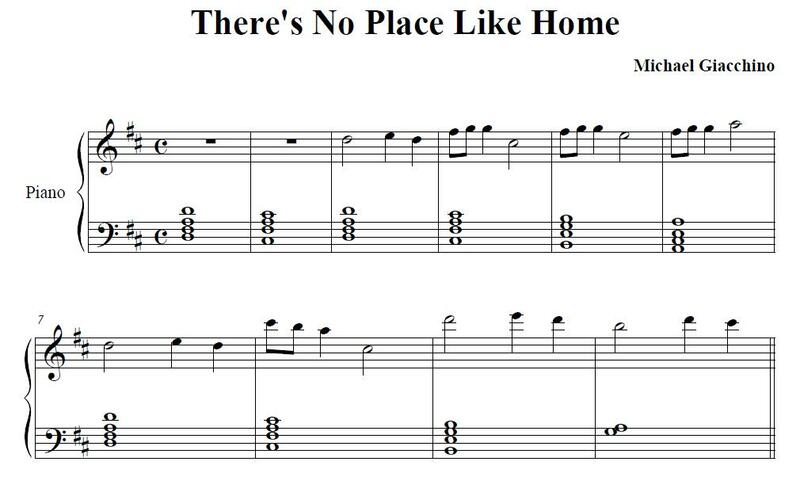 Also note how the first two chords for both “Home” and “Life and Death,” arguably the heart of the both cues, are related by a third – DM to F#m and BbM to Dm respectively. Further, you may notice that the countermelody is a sequenced and altered version of the eighth-note ostinato heard in the above Locke theme. In fact, many of these themes do bear a resemblance, if not explicitly musical, at least “spiritually.” This is all brought home in the final scene of the series in which “There’s No Place Like Home,” “Life and Death,” and “Parting Words” all make an appearance. I’ll forgo posting a clip of that just in case. While the above clips are indeed spoilers, they would not really ruin ones enjoyment, the last scene of the series, on the other hand, would be a bit to much for a Lost virgin. I hope that this modest post has provided a glimpse into how Michael Giacchino constructed some of the best musical cues of the series, and indeed, for any television show ever aired. Update 6/13: I’ve gone back and fixed a few things in the voicings in the “Parting Words” transcription.